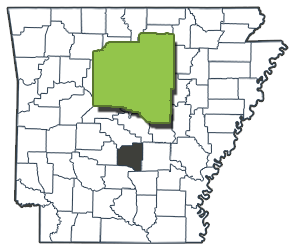 In 1869 when Ulysses S. Grant was President, Grant County, Arkansas was formed. Sheridan is the county seat. Grant is a large, rural county of rolling, pine-covered hills where cutover timberland is now a bird sanctuary. Hunting, fishing, and boating are popular along the Saline River and at Jenkins Ferry State Park, a Civil War battle site. Grant County Museum exhibits artifacts from early Indian cultures as well as Caddo, Quapaw, and displaced Cherokee and Choctaw, who owned land here in the early 1800s. Today’s red brick courthouse preserves corner markers from the 1910 courthouse and houses the first public clock in the county. Friday, April 19, 2019--The Courthouse will be closed in observance of Good Friday! Saturday, May 4, 2019--Heritage Day, 150th Anniversary for Grant County! Monday, May 27, 2019--The Courthouse will be closed in observance of Memorial Day! Thursday, July 4, 2019--The Courthouse will be closed in observance of Independence Day!